It is that special time of year. Hawks are in the air, you have heard them call, you have seen them circle high in the sky. You have been enriched by their overwhelming beauty, and the privilege of knowing that those magnificent birds soaring at the top of the food chain are once again on their way south for the winter. You hope it was a successful summer with healthy broods and ample food to strengthen them for their long journey. You long to reach out, you long to soar with them and you long to learn so much more about their plight and migration. 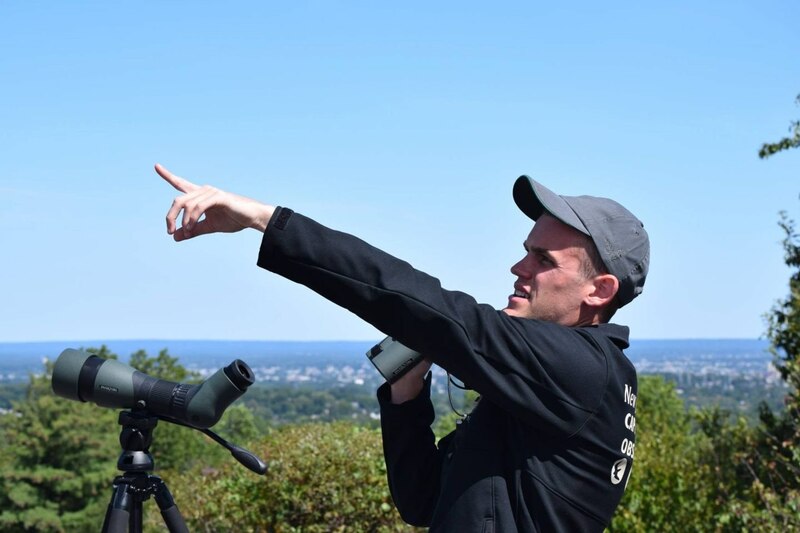 The NJ Audubon Montclair Hawk Lookout is indeed one of those very special places from where to watch the Hawks in Flight. 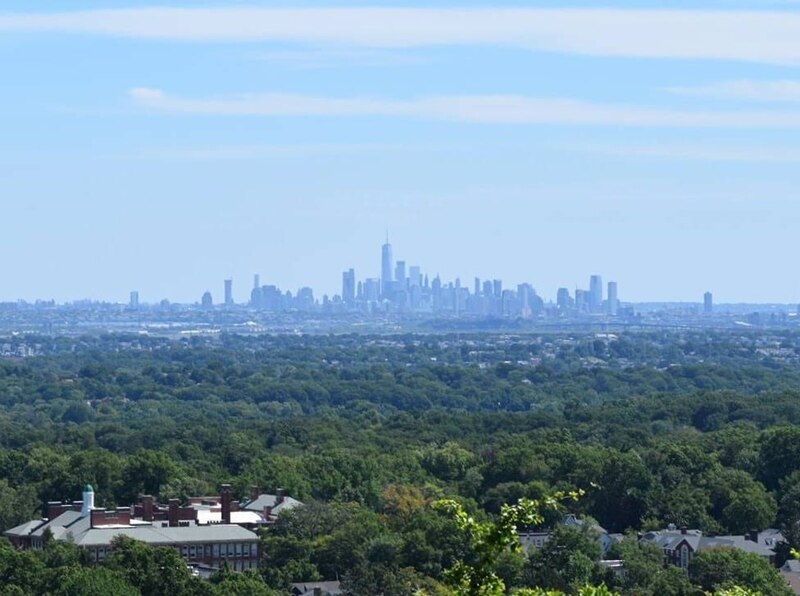 Nestled atop a 500-foot basalt ledge on a ridge known as the First Watchung Mountain in Montclair, New Jersey, is a well constructed, stone-filled platform that is the site of the Montclair Hawk Lookout, a sanctuary of the New Jersey Audubon. This is the first ridge west of the lower Hudson River Valley, and runs from northeast to southwest. What makes this site interesting during migration is the mixture of both coastal and ridge flights. In some years, exceptional Broad-winged Hawk flights have been observed in the Fall. The view from the platform is spectacular, considering its location amidst one of the most densely populated areas in the country. While participating in the “hide and seek” search for hawks in the ever spinning billowing clouds above, one can be treated to the south and east with a view of the Verrazano Narrows Bridge, the entire New York City skyline including the Statue of Liberty, all the way northeast to the Palisades. To the north and west, peaks from the Ramapo Mountains can be discerned, and the beginning of the Second Watchung Mountain. The NJ Audubon Hawk Watch came to be in on September 18, 1959 and is the organizations smallest sanctuary at 1 acre. It is the second oldest continuous hawk watch in the nation. Only Hawk Mountain boasts a longer record. To reach the Montclair Hawk Watch from the Garden State Parkway in Bloomfield, take exit 151 for Watchung Avenue and head west on Watchung to its end at Upper Mountain Avenue in Montclair, about 2.1 miles. Make a right turn and go north on Upper Mountain 0.7 miles to Bradford Avenue. Make a left turn and go up Bradford 0.1 miles to Edgecliff Road and make a right turn. Go up Edgecliff 0.2 miles and park on the shoulder (to avoid parking problems, please park well off the side of the road). The lookout path is on the south side of the road. The Montclair Hawk Watch is easily reached via mass transit, as it is located in the heart of northern New Jersey’s urban complex, an important factor in these days of high traffic congestion. Walking time from the railroad and bus station on Bellevue Avenue in Upper Montclair is about 15 minutes. Take Bellevue west (up the mountain) to Upper Mountain Avenue, turn right and follow the directions above. Patience, dress in layers according to the season, wear comfortable shoes, binoculars, sunblock, and a smile in your heart. Early September gives hawkwatchers the chance to polish their tools and work on their identification skills as the Sharp-shinned Hawks, Broad-winged Hawks, Osprey, American Kestrel and an occasional Bald Eagle are spotted from the Lookout. By mid-September the excitement builds as the Broad-winged Hawks begin to appear in small groups (known as kettles). The Broad-winged Hawk is the “special” species for which the Montclair Hawk Lookout is well known. The peak flight days, if weather conditions are right, are usually during the third week of September, when groups of hundreds and sometimes thousands of these beautiful birds can be seen in one day. At the end of September, the skies are filled with hawks on the move, as the number of Sharp-shinned Hawks increases, Cooper’s, early Red-tailed and Red-shouldered Hawks begin to join, and the Falcon families take to flight. In addition to the hawks, numerous songbirds are seen and the graceful peace of the migrating Monarch Butterfly is felt throughout the month. October may be the most interesting time to visit the Lookout, as it offers the greatest diversity of hawk species. Chances are now better to see Merlins or even a Peregrine Falcon or two. However, by mid-month the Broad-winged Hawk flight will be over for the season, as other species begin to peak. The Red-tailed and Red-shouldered Hawk will be most numerous at the end of the month. As November winds sweep the land, the skies are reserved for the big birds (no, not those big yellow fuzzy woolen ones). The Red-tailed and Red-shouldered Hawks continue to greet us and a special visitor from the far north, the Rough-legged Hawk, is a possibility. Finally, the majestic sight of a Golden Eagle is sure to warm even the coldest soul. One need only look at a child’s face beaming at the sight of a soaring Bald Eagle or the glorious colors of an American Kestrel to realize that while the count itself is important, it is the shared experience of the beauty of these birds and the mystery of migration that is at the core of the Montclair Hawk Watch. While sharing in the quest of the Autumnal wingspan, we reach out for an increased knowledge and a growing awareness of the plight of the birds of prey . . .
On September 18, 1959, The Montclair Hawk Lookout, all one acre of it, became NJ Audubon’s smallest sanctuary, a gift from the Montclair Bird Club. Today, a crushed stone-filled platform sits atop a rock cliff on a basalt ridge of the First Watchung Mountain and commands a panorama of nearly 360 degrees, offering views of landmarks up to fifty miles away. Woodland and suburban development surround it, while the skyline of New York City rises thirteen miles to the east. This is the first ridge west of the lower Hudson River valley and runs from northeast to southwest. What makes the site unique during migration is the mixture of both coastal and ridge flights. Some twenty years earlier, the Raritan and Passaic Valleys Ornithological Club (later renamed the Urner Ornithological Club) had made regular observations of raptor migrations in the Watchungs for seven seasons. But it wasn’t until the Montclair Hawk Watch was formally organized in 1957 by three members of the Montclair Bird Club — Ruth Edwards, Suzanne Haupt, and Ruth Breck — that “Operation Hawk-Watch” began. When the lookout appeared doomed by the onslaught of urban development, these three formidable women, together with a great many other birders, were galvanized into action. They aspired to set aside as a sanctuary this bald outcropping of rock, a vantage point to observe the annual spectacle of migrating hawks and other species of birds on their way south, so that future generations of nature enthusiasts could watch, study, and enjoy the spectacular autumn hawk migration. The original site, three small parcels along the east edge of the ridge, was acquired for the Montclair Bird Club by George Breck when it was sold by the town of Montclair for non-payment of taxes. The club reimbursed George and donated the land to NJAS. Since only a part of the site actually used by the hawk watchers had been acquired, and the access was through private property, it took the extraordinary efforts of board members Milt Levy and Jean Clark to make the present lookout a reality. Milt jumped at the chance to negotiate a land swap when adjoining property was being subdivided for development in 1982. Negotiations went on for several years in a complicated and exquisitely orchestrated land swap that finally secured the smallest of parcels for the dearest of causes — a hawk watch in northern New Jersey. “Joy all around!” Milt concluded, when the settlement was complete. As part of the arrangement, a stone platform was constructed which allows use of the site by the many human visitors who appear as suddenly as the hawks arriving on the northwest winds at the height of migration. On September 16, 1988, pone hundred friends and admirers of Andy Bihun gathered at the hawk watch to dedicate a newly constructed platform in his honor. There were tributes and a splendid reception. However, the greatest tribute to the man was the number of hawks recorded before, during, and after the ceremony — 17,420 — the greatest single day count in the history of the Montclair Hawk Watch. Reprinted from One Hundred Years and Still Counting, by Libbie Harrover Johnson, 1997. On Friday, September 16th, 1988, the Montclair Sanctuary of the New Jersey Audubon Society was dedicated in memory of Andrew Bihun, Jr. Many of Andy’s family and friends were on the lookout, along with all of the officials from NJAS who had put tireless effort into making the sanctuary a reality. It was most graciously hosted by Mr. and Mrs. Edward Ringley of Cedar Grove. A clear day with winds blowing gently from the north, high cirrus clouds and mild temperatures set a beautiful stage for what was to become a record breaking day. As the morning sun warmed the ridge, broadwings filled the valley, and kettle upon kettle billowed up and up gracing the sky. By mid-day 6,850 hawks had been tallied on their way south. The beautiful tapestry was interwoven with flights of sharp-shinned hawk, Cooper’s hawk, kestrel, osprey, northern harrier and bald eagle. The early afternoon proved even more spectacular as rivers of broadwings continued to pour out of the northeast high in the sky. By this time many people were on the lookout, hands and eyes filled with emotion as we witnessed this magnificent flight. Between 1 and 4 p.m. an additional 8,866 had been counted. The birds kept coming as more people were gathering for the ceremony. In the late afternoon a bald eagle was spotted circling up above the New York skyline to the east with a small group of broadwings. During the ceremony a lone northern harrier passed the lookout before sailing into a beautiful sunset. A very special flight occurred that day, as 17,420 hawks filled the skies above the Montclair lookout, making it a perfect tribute.